Do you know that you can now add a cover photo on Twitter? Add a cover photo that represents your brand today. 1. Click on ‘edit profile’, which can be found on the top bar when you hover over the gear icon. 2. Thereafter, click on ‘Design’ located on the left sidebar. It should be the third item from the bottom on the sidebar. 3. 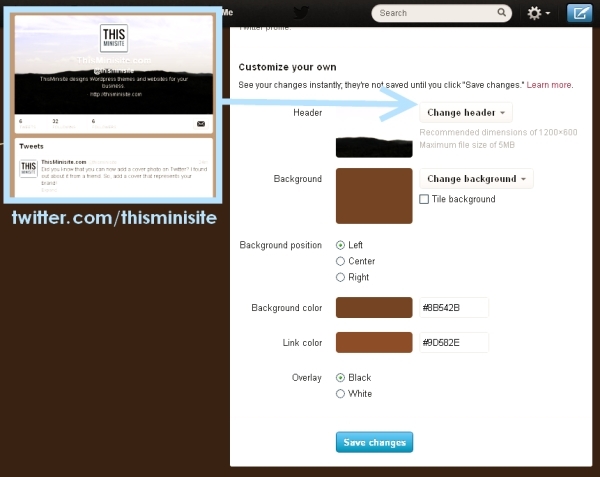 Navigate to the section ‘Customize your own’ (as shown in the illustration above) and click on ‘Change Header’.